Well as you know from my last post we made it home from CHA – YAY! We were lucky enough to be on a flight that was not cancelled and I felt so bad for all those people who were stuck in LA away from their families. I hope everyone is now home safe and sound. All I can say is WOW! Having YNS at CHA was an amazing experience and I had so much fun meeting people from all over the globe. Vendors and retailers come from everywhere to exhibit and shop! Many of you have been looking for stores in Australia and the UK so look no further – YAY! Plus I’d like to give special thanks to these amazing stores who continue to bring YNS to their stores for all of you to enjoy! If you don’t see your local store listed here please let me know as I would be happy to contact them and send them a YNS catalogue. Here are a few photos we took at CHA. I always have good intentions on taking more but then time flies by and before I know it the event is over! Here is a photo of Jenny and I with a few of the Splitcoast gals! Here is a photo of the amazing class kit designed by our very talent DT member Maureen. It’s a Double Surprise Match Box!!! Want to learn how to make this? This kit is only available to retailers so ask your local store to contact me for the stamp set and class instructions. Well, I’d better be going now so until next time…Happy Stamping! We are back from CHA and I promise to update everyone really soon!!! 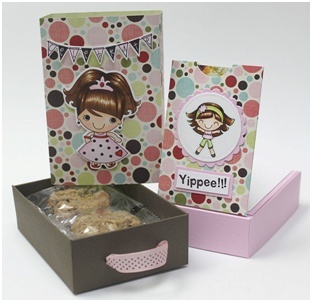 Today I’d like to announce our CHA Blog Hop Winner and then check back this weekend for all the YNS CHA news – YAY! Thank you to everyone who hopped along…the DT and guest creations were all amazing!!! I just can’t get enough of those adorable World Kids and all the mini’s are just too much FUN!!! Quick order update – all orders that were placed while I was away have been shipped – thank you to everyone for your patience and understanding. This weekend I’ll announce all the fabulous new stores that are now carrying YNS!!! YNS CHA Release BLOG HOP!!! I don’t even know where to begin…I am just over the top excited about taking YNS to CHA for the very first time! That’s right, as you’re reading this I will be at the Winter 2011 CHA – booth #4518! WOO-HOO!! So to celebrate this event, I’m releasing some fab new YNS stamps just in time for CHA. You may have already caught a sneak peek of some of them last week over at the Scrapbook and Cards Today blog, but today you get to see all 9 World Kids stamps plus a fabulous new Celebrate Collection from HR Designs and 7 new mini stamps. YAY! Of course we couldn’t let this release pass by without having a fun blog hop! We also have 4 fabulous guests joining us for our hop – the amazing Tori Wild, Cindy Haffner, Carole Burrage and Maylee Pham! If you would like to participate in the hop and you didn’t arrive here from Wendy’s blog, please CLICK HERE to return to the start of the hop at Kerri’s blog, as you don’t want to miss these fab new releases! You will see that every stop along the hop has a linky list – this is the SAME linky list posted on every blog, so that you can enter the prize draw from any stop (although we hope you will visit all the blogs on today’s hop!). The linky will update itself on everyone’s blog when a link is entered – how cool is that? Please remember to only enter your name ONCE into the linky list during the hop – you do NOT need to enter your name at every stop and multiple entries will be removed. It’s not a requirement for you to comment at every stop along the hop to be eligible to be entered into the prize draw, but the DT would sure love to hear what you think of their new release creations! I’m is also running some special bundle promotions, so be sure to hop on over to the YNS store once you’ve finished the hop. If you order all 9 World Kids stamps in one bundle, you will save 15% over the cost of buying them individually! Congratulations, you’ve reached the end of our YNS hop! Thanks so much for joining us, I hope you enjoyed all the fabulous hop creations and love the new release as much as I do :o) I’d like to thank Fhiona Galloway for creating these adorable World Kids and Heather Rolin for the super fun birthday stamps! Also on behalf of the entire DT…a big thanks goes to Simonne for organizing this amazing and FUN blog hop! I’d love for you to leave me a comment and then hop on over to the YNS Store to take advantage of the sale and pick up some YNS fun and whimsical rubber stamps for your collection! I’ll be in touch with lots of photos once I return from CHA!